BEFORE YOU START: Create a new folder on your network space, called AUTOCAD. In this AUTOCAD folder, create another new folder called “AUTOCAD_1”. Save the following figures into this folder, call them drawing1.dwg, drawing2.dwg, etc. Problems 1-4: From the RED BOOK, replicate the following figures, USING ANY VERSIONS OF THE LINE COMMAND THAT YOU WISH. • PAGE 32, recreate the figures for problems 3-4. Save these problems to your “AUTOCAD_1” folder as drawing1.dwg, drawing2.dwg, etc. PROBLEM 5- A lot of the challenge and the “fun” of AutoCAD is figuring out exactly how to complete a drawing. As an example, please follow along on the following video tutorial where Mr. B. completes this drawing of RED BOOK, Page 33, Problem 1. 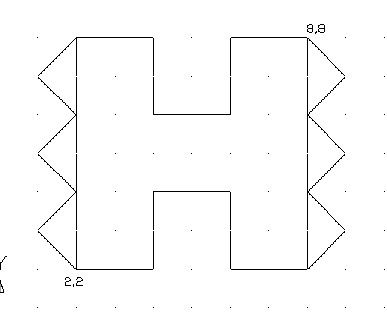 This was recorded on an earlier version of AutoCAD, but the principle is the same in AutoCAD 2015. • Video Walkthrough, RED BOOK, page 33, problem 1. Once you have watched the video, recreate the figure on Page 33, Problem 1. Save as drawing5.dwg. PROBLEM 6: Page 79, Problem 5. (Start with what you know how to do. Work your way around to the 45 degree angle last!) Save as drawing6.dwg. PROBLEM 8- Recreate the figure below, using any versions of the LINE command that you wish. (NOTE that the figure STARTS at point 2,2). Save as drawing8.dwg. SUBMITTING YOUR WORK: I will grade all of the problems for AutoCAD_1 directly out of your folder on your network Drive. Make sure that you include all problems above AND the practice files that you created when you went through the video tutorials! GRADING: I will be grading AutoCAD work in two ways. First, I will be giving a regular Professionalism" Grade each week, in which you will be graded on your focus and work ethic for the week, as well as your attendance and general behavior (as per the syllabus for the course). This is going to be a weekly 10 point grade. I will also be grading your completed assignments and figure each week, as well. I will randomly select a small number of problems that you have completed for the week and grade them for accuracy. This will be a 25 point grade. CONCURRENT ENROLLMENT STUDENTS: I will be grading your work as above, but your randomly selected problems each week WILL INCLUDE the challenge problems.